French niche house Serge Lutens has launched L'Eau d'Armoise, a new fragrance. L'Eau d'Armoise joins existing fragrances Fleurs de Citronnier, Gris Clair, L'Eau Froide, L'Eau de Paille and Santal Blanc in the new collection Les Eaux de Politesse, introduced with the tag line “Come into the light or disappear into the shadows? There is a time for everything”. 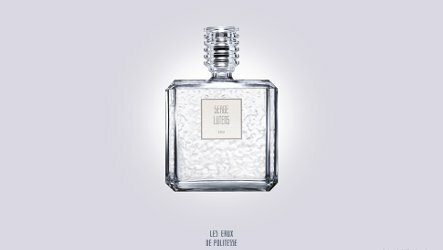 Serge Lutens L'Eau d'Armoise is £110 for 100 ml. Update: the notes, according to Saks, are bergamot, mugwort and immortelle; $160. I do like the cheerful, green smell of mugwort, but this seems like a meek little perfume, doesn’t it? Is meek in? No idea if it is meek, but the “politesse” plus the packaging does make it sound like a clean / bath product. I really don’t get the point of all these bottles/lines. I am curious to try this though. Also glad Gris Clair…. is back and still affordable. It is all designed specifically to make me lose all interest in Serge Lutens. Exactly! You’ve nicely described my thoughts as well. Sounds very clean, transparent, fresh and watered-down. Got mixed feelings for the bottle as well. Bottle looks like it holds a bath product, which might turn out to be the case. Ha but I actually like it better than the original L,’eau Froide bottle which is so narrow it looks like it will topple over in my son’s bottle collection. I didn’t even know there was a separate line! It’s newly combined of existing SL plus this one new. Did they *have* to call it “mugwort” when the much nicer word “artemisia”, the English version of “armoise”, already exists in the language? Anyway, I see that Gris Clair…. and Santal Blanc must have been reformulated into dullness and politesse, because they didn’t used to be: they weren’t loud, but GC was a dazzling, otherworldly lavender and SB a strict, highly polished wood, both of them fascinating, neither one polite or boring in the least. And so the house of Serge Lutens continues its descent into irrelevance.